The restored 1894 Chicago & North Western Railway depot serves as the starting point for museum visitors. The Mid-Continent Railway Museum is a railroad museum in North Freedom, Wisconsin, United States. The museum consists of static displays as well as a 7-mile round trip ride aboard preserved railroad cars. Mid-Continent Railway Museum's collection emphasizes the preservation of railroad items operated in the upper Midwest from the period of 1880-1916, what the organization refers to as the "Golden Age of Railroading". During that time, railroads saw an unprecedented rate of expansion, growing in size in the United States from 93,000 to 254,037 miles of track. Three steam locomotives are currently under restoration to federal guidelines. The museum has 13 steam and 7 diesel locomotives including Chicago & North Western # 1385 and over 100 other pieces of rolling stock. The museum has the largest collection of wooden passenger cars in the United States as well as six of only seven surviving wooden boxcars built by Mather Stock Car Company and the nation's last surviving fish car, Wisconsin Fish Commission "Badger Car #2". The depot is an original Chicago and North Western Railway depot from the small town of Ableman, now known as Rock Springs, Wisconsin. It was built in 1894 and moved to the museum to its current location in 1965. The depot consists of two seating areas separated by the ticket office. A gift shop now occupies the former freight room. The interior was extensively renovated following water damage during flooding in June 2008. In addition to the depot, other railroad structures moved to the museum's location include a crossing shanty, crossing tower, section shed and water tower. Additional structures have been built new to house and maintain the collection but attempts were made to make the structures appear period appropriate. The rail line used by Mid-Continent Railway Museum is a spur off the original Chicago & North Western Railway main line. With the development of the Illinois Iron mine in early 1903, the C&NW sent a team of engineers on July 8, 1903 to survey a route to the iron fields. By August 12, C&NW president Marvin Hughitt had arrived in North Freedom in person to announce that a branchline would be built. A second major mine, the Iroquois Mine (also called the Sauk Mine) was established in October not far from the new rail line. By December 1903, the 3-mile (4.83 km) branchline was completed at a cost of $40,533. To support the increasing number of miners in the area, a new town called La Rue was platted, named after William G. La Rue. William La Rue was an area mining pioneer who demonstrated the latest technological advancements in diamond drill technology could make iron mining in the area economically feasible. The town was surveyed and registered in January 1903, but it was soon realized that its location in the southwest corner of the intersection of present day Highway W and Diamond Hill Road would prove to be too far from where the mines were developing. By November 1903, the development of the town shifted nearer to the Illinois Mine, one-half mile (0.8 km) to the south, at the present day location of La Rue. At the height of iron mining production, the population of La Rue likely did not exceed 50 people, but the town did include a hotel, lumberyard, church, general store and two saloons to supply and entertain the several hundred miners living nearby. Another townsite named Oliver was platted just east of La Rue, slightly closer to the Oliver Mining Company-owned Iroquois Mine, but no construction ever occurred. At its peak, the Illinois Mine was shipping between five and twelve train car loads daily over the C&NW branchline, but La Rue’s ironing mining days would be numbered. By June 1904, the mines were reaching depths of 400–500 feet (122–152 m) at which water infiltrating into the mine shafts began being problematic. Costs continued to grow as a result of the water infiltration until finally the Illinois Mine closed in 1908. By this time it was burdened by costs associated with pumping out 2,600 gallons (9842 L) of water per minute. A similar fate befell the Iroquois Mine in 1914, at which time it was pumping 4,500 gallons per minute (17,034 L) from its mine shaft. With the end of iron mining operations, the town of La Rue quickly disappeared. By 1925 only one building remained, the La Rue tavern which still stands today. Mid-Continent Railway Museum route map. As the La Rue area iron mining days were ending, the need for quartzite rock was increasing. In 1917, the Harbison-Walker Refractories Company established a quarry south of La Rue. The railroad track was extended 0.8 miles (1.3 km) south to serve the quarry. Operations continued until 1962 when the quarry ceased operation. The rail line was slated for abandonment soon after. Meanwhile, in 1959, a group of rail enthusiasts from the Milwaukee, Wisconsin area had joined together to form the Railroad Historical Society of Milwaukee. With the group’s first acquisition of the Consumers Company #701 steam locomotive, the search for a home for their collection began. An agreement was reached with the Hillsboro & North Eastern Railroad to operate diesel-powered train rides over their line beginning in 1962 under the name Mid-Continent Railway Museum. When it was learned the North Freedom branchline was available in 1962, the line was quickly purchased and the small collection of cars and locomotives were moved to North Freedom in 1963. By the summer of 1963, the move was finished and repairs to steam locomotive C&NW #1385 were completed, allowing steam train rides to be offered for the first time that summer. Train rides have been offered out of North Freedom by the museum every year since and a small train yard was gradually built to hold the growing collection of preserved rail equipment. 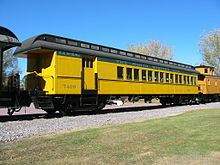 The museum operates a heritage railroad which offers passenger excursion trains on a 7-mile (11 km) round trip. Trains leave from North Freedom, Wisconsin, pass through the former mining community of La Rue, Wisconsin and turn around at a rock quarry, returning on the same route. The excursions take approximately one hour and operate daily from early June through Labor Day and most weekends in May, September and October. Trains operate at a top speed of 15 miles per hour (24.1 km/h), requiring approximately 20 minutes to travel the length of the rail line. Roughly 15 minutes are spent at the end of the line to move the locomotive to the opposite end of the train for the return trip to North Freedom. During the ride, a uniformed conductor punches passengers' tickets, shares railroad history and answers questions. Special event trains are also offered several times throughout the year, including Autumn Color weekends in the fall, Pumpkin Special runs near Halloween, Santa Express Weekends at the end of November, and the Snow Train in February. During special events, additional ride options are frequently offered such as first class trains, dinner trains and brunch trains which offer onboard food and beverage service and utilize cars which are more luxurious than the train cars typically used. For most of the museum's history, nearly all trains were pulled by steam locomotives although since February 2000, all trains have been pulled by diesel-electric locomotives pending the restoration or repair of the museum's steam locomotives. In June 2008, the museum grounds were inundated by floodwaters of the Baraboo River. The museum closed for repairs until February 2009. Although most damage caused by the June 2008 flood has been repaired, money for repairs to the museum's Baraboo River rail bridge has not yet been found. The bridge's out-of-service status did not affect the route used by the museum's train rides, but did prevent the movement of rail cars and locomotives to and from the museum via the national rail network. Repairs to the bridge were completed in July 2018. ^ "About Us". Mid-Continent Railway Historical Society. Retrieved January 29, 2018. ^ Mid-Continent Compendium. Mid-Continent Railway Historical Society, Inc. 2005. p. 11. ^ "Mid-Continent Railway Museum Equipment Roster: Akron Canton & Youngstown #3011". Retrieved January 29, 2018. ^ Tour of the Yards (fourth ed.). Mid-Continent Railway Historical Society, Inc. 2012. ^ Mid-Continent Railway Gazette (Vol. 36, No. 4). Mid-Continent Railway Historical Society, Inc. 2003. ^ "A Mid-Continent Timeline". Mid-Continent Railway Historical Society. Retrieved January 29, 2018. ^ "A Wisconsin Tradition Survives and Thrives". 27 January 2009. Archived from the original on 8 August 2014. Retrieved 13 July 2012. ^ Bromley, Ben (July 8, 2018). "Mid-Continent reopens river bridge". Baraboo News-Republic. Archived from the original on August 21, 2018. Retrieved August 22, 2018. Wikimedia Commons has media related to Mid-Continent Railway Museum. This page was last edited on 23 October 2018, at 20:00 (UTC).